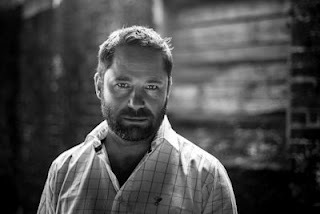 Please welcome Tarn Richardson to The Qwillery as part of the 2016 Debut Author Challenge Interviews. The Damned was published by The Overlook Press on March 1st. Tarn: Hello Qwillery! Thank you for having me. Well, I remember very clearly the age I was when I knew I wanted to be a writer. I was eight and our teacher at the school I attended in Somerset, England, was reading us The Hobbit. I'd never heard anything like it before. The language, the scenes, the characters, the huge vision, all of it seemed so obvious to me, as if I understood entirely what Tolkien was trying to say. I was flabbergasted. I knew right then I wanted to write stories. I started to write novels when I was at art college, a lazy good for nothing student with these big ideas but absolutely no finesse or ability to finish anything! Throughout college, university and various job in media, I kept writing, on and off for twenty years, a million plus words, never finishing a single novel, just trying to find my voice and something which would stick, everything utter rubbish until I discovered The Damned, or maybe The Damned discovered me? Why did I write? I suppose like most writers, it wasn't a choice. Something inside has always compelled me to write, to tell my stories, to exorcise my demons. Tarn: I definitely was a pantser, although after the second book in the The Darkest Hand trilogy, The Fallen, very nearly killed me, I've since become more of a hybrid. I got lucky with The Damned. I had an idea of where I wanted to get to and the path to that point revealed itself as I wrote. My second unrelated and yet to be released novel which I wrote straight after The Damned followed in the same manner. Just poured out of me. I was on a roll! I then hit big problems writing The Fallen without a clear plan and ended up writing and rewriting it NINE times in 18 months. It was murder on me, my sanity, my family and my fingers. Tarn: Balancing writing with work and family. Being a debut novelist, the income from my writing is tiny at the moment, certainly not enough to pay for a household consisting of two hungry boys and hungrier cats. So I have to write around running my own business, which means evenings, weekends and holidays are often spent on my own in my office tapping away. The exhaustion of writing at the end of a busy day is one thing, but the sacrifice I make, but also my family makes, in the hope that one day things might turn favourable with my novels and they might start making an income, is a burden you have to bear if you want any chance of making it. But, in my experience, all the best writers are very very selfish individuals, so I shut out the guilt, shut the office door, drink strong coffee and get on with it. Tarn: Mrs Jones reading me The Hobbit at eight was the spark which lit the fire in me. Tolkien, Dave Eddings, the British comic 2000AD, Alan Moore, Frank Miller, John Wagner, Pat Mills, they're all literary touch points to making me the writer I am today. Certain music and songs can inspire and turn on my writing brain. I wrote much of The Damned listening to this Norwegian black metal band called Kvelertak. One whirl of that and I was instantly in the trenches of World War One. And everyday things around you influence and inspire, from injustices and horrors you read and see in the news, to watching people grey and diminished from their careers, commuting to and from work, it all goes into the mix. Much of the central character within the book, Inquisitor Poldek Tacit, was borne out of seeing these poor souls flogging themselves half to death on jobs they hated and then drinking themselves half to death on the train journey home. TQ: Describe The Damned in 140 characters or less. Tarn: A gripping work of dark fiction set in an alternative World War One, where werewolves roam and a ruthless inquisition still hold sway. TQ: Tell us something about The Damned that is not found in the book description. 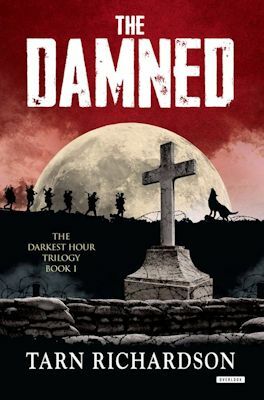 Tarn: As well as being a murder mystery thriller, The Damned is also a study of what makes people who they are, how individuals can become corrupted and broken by their past, become monsters on the power given to them, or crippled by the fear of expectation. I love writing about what makes us who we are, giving characters depth and setting them in situations where natural instinct reacts before they have the opportunity to consider their actions. I am very proud of bits in The Damned and almost all those bits are related to the revelations in characters' pasts and their development through the book. TQ: What inspired you to write The Damned? What appeals to you about writing Dark Fantasy and also Alternative History? Tarn: It was 2012 and I had just come back from France where I had been visiting the trenches with my father and brother in law on the trail of two great uncles who fought out there in the Great War, one who came back and one who did not. It was an incredible trip, really moving and inspirational and I just felt I had to write about the experience. So, when I got home from France I started planning this grand epic of World War One, sort of like Game of Thrones meets Band of Brothers. Which no one really wants! And pretty soon I had got myself tied into knots and wasn't making much progress. Then one night I was sitting down and reading a bed time book to my youngest son Will and he stopped me and said that the book I was reading was 'boring'. So I asked him what he would write a book about and he immediately replied, "World War One and werewolves" and a light came on in my head and after that I was off and running! Out of the mouth of babes! In World War One, soldiers really weren't thought of as individuals, they were thought of more as tools by their commanding officers, the people planning this terrible war and who weren't on the front line themselves. These officers were monstrous, but would always counter any doubt by saying they were being 'monstrous to avoid becoming monsters' i.e "Monsters we are lest monsters we become." I've always liked this saying, something which can also be attributed to the poor souls who were in the trenches who actually did the fighting and these monstrous things simply to stay alive. So armed with this quote, and the concept of werewolves in the trenches, I had a plan in my head! Dark Fiction and Alternative Fiction allow you to take these ideas and themes and stretch and extrapolate them out so they take on even greater meaning and resonance. It's the wonder of this genre. TQ: What sort of research did you do for The Damned? Tarn: Visiting the sites featured in the book, Arras, Fampoux, the trenches of the front, was an incredible opportunity to really soak up the atmosphere and feel a little of the landscape and surroundings which would have greeted the men when they arrived on French soil. Of course, the land was ravaged by the first barrages of war at that time when the book is set, but the rolling undulating countryside still remains as it was back then and it's incredibly poignant to walk around it and imagine, or at least try to imagine, the terror and the horror of what happened there. I also spent many hours at the National Archives at Kew In London reading these beautifully written army diaries of the soldiers in the trenches, detailing troop movements, activities and behaviour. I also read a lot of research books on World War One and those early months of the conflict. I used to hate research but as I've got older and uglier, I've come to really enjoy immersing myself in a subject so I can give the reader as truthful an account as possible. Lastly, I had a great time digging through old tomes and peculiar websites on werewolf folklore and its connection with the Catholic Church. Pretty quickly everything started to fall neatly into place; the locations, the events, the people and the superstitions, as if it was the novel was writing itself. Tarn: That's a great question! I think Lieutenant Henry Frost was the easiest to write, because I suppose he was the closest in personality to me - and English! He's an officer in the British Army, a career soldier, but with his conscience, and perhaps his naivety, still to be knocked out of him. He's trying to do his best in a complicated world he increasingly grows to despise. Interestingly, he became the hardest character to write in the sequel (which I have just finished). As for the hardest character to write in The Damned, I would say that must be Sandrine Prideux, simply because she is so terribly complex in herself as well as wildly spirited in her personality. All her life closeted away, working and doing for others and suddenly she's set loose to live and be free and yet she's not free at all. I can't say too much, because it will reveal the book's secrets, but she was tricky at times but also wonderful to portray. TQ: Why have you chosen to include social issues in The Damned? Tarn: From the very start I knew I wanted to incorporate social issues into the book. Writing gives you the opportunity to raise serious points you feel strongly about, even if you mask them under a wonderfully fast paced and violent historical fantasy thriller! So they're there if the reader wants to acknowledge them, or they can just enjoy the action packed adventure on its own. I was really keen to explore class and whether where we come from and what we experience as children defines us adults. And, of course, World War One was entirely about social issues, a war of class, a war where the rich sent the poor away to fight in order to prove who of the royal dynasties had the biggest and best empire. TQ: Which question about The Damned do you wish someone would ask? Ask it and answer it! Tarn: "Would you like to sign this contract here for the film rights to The Damned?" "Go on then. And can I be an extra?" Of course, this is a holy grail for a lot of novelists, having their book turned into a film. But everyone who's read The Damned describes it as 'very filmic'. So I am hoping there's something there! Being a big comic reader, twinned with my background in film and media, I think the book is very visual and I do think it could translate well, both as a graphic novel but also an 'epic' movie. Whether the end result would carry the gravitas and depth I've tried to build into the pages, or go for the easy option of an out and out action thriller, we'd have to see. I think often Hollywood settles for the easier of the two routes in the hope of mass appeal, rather than select artistic appreciation. I'd be happy to investigate! TQ: Give us one or two of your favorite non-spoilery quotes from The Damned. There came a sudden tumultuous roar of gunfire from the distance, followed by the strained cries of men, the blowing of many whistles, the steel ring of shells and the thump and bang as they landed. The noise sounded very far off from the bottom of the trench. “Have you lost your way? Tarn: The sequel, The Fallen, comes out in the UK and Australia in May this year and I am currently writing the third and final part of the trilogy, The Risen. Then? A very long and nourishing sleep! Tarn: Thank you very much. I enjoyed it. In this "sublime work of dark fiction" (Intravenous Magazine), set in an alternative World War I, unspeakable creatures roam the grisly trenches, and a ruthless Catholic Inquisition holds sway ― still powerful, but working in the shadows. When a Father is brutally murdered int he French city of Arras, Poldeck Tacit―a determined and unhinged Inquisitor―arrives on the scene to investigate the crime. His mission: to protect the Church from those who would seek to destroy it, no matter what the cost. As the Inquisitor strives in vain to establish the truth behind the murder and to uncover the motives of other Vatican servants seeking to undermine him, a beautiful and spirited woman, Sandrine, warns British solider Henry Frost of a mutual foe even more terrible lurking beneath the killing fields―an enemy that answers to no human force and wreaks its havoc by the light of the moon. Faced with impossible odds and struggling with his own demons, Tacit must battle the forces of evil―and a church determined at all costs to achieve its aims―to reach the heart of dark conspiracy that seeks to engulf the world, plunging it even deeper into conflict. Tarn Richardson was born in Bristol in 1972 and developed an unhealthy interest in ghosts, ghouls and things that go bump in the night from a very young age. When he was seven, he moved to a remote seventeenth century farmhouse near Taunton, Somerset, rumoured to be haunted by the ghost of a little girl - the news being the icing on the cake as far as Tarn was concerned. Growing up on a diet of Tolkien, David Eddings and 2000AD comics, after school Tarn attended art college, spending most of the year writing when he should have been drawing, and he’s not stopped for the last twenty years. He’s worked for IBM working as a copywriter, writing scripts for CDs and content for the very first web sites, as well as murder mystery dinner party games, including titles for The Whodunnit Murder Mystery Company. In 2014, he was offered a three book deal with Duckworth Overlook. THE DAMNED is his debut novel, the first in a trilogy featuring troubled inquisitor Poldek Tacit. He lives in Salisbury, England, with his wife, two sons and two cats.